Part number was as ordered and the fit was exact. Shipment was prompt. No problems were experienced with this part. It was a factory OEM part as ordered. Item is exactly what we needed. Easy to install. Great quality and very fast shipment. 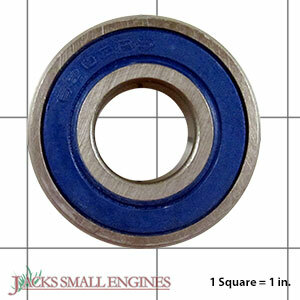 Bearings are not made by Jack's but it is a great deal price wise. Fit very nicely on shaft. Ask us about the Husqvarna 532110485 Bearing. Please no repair questions. Your Q&A may be posted to Jackssmallengines.com to help other shoppers, like you, with their purchasing decisions. Thank you. Gary, this is just one bearing.